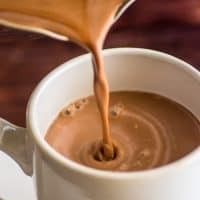 A quick, easy, and delicious 3-ingredient hot chocolate recipe for those times when nothing else will do. In a small saucepan, over medium heat, combine sugar, cocoa powder, and water. Stir until sugar and cocoa powder dissolve. Add milk and salt and stir. Heat until the mixture reaches your desired temperature, stirring occasionally. Pour into an 8-ounce mug and top with optional whipped cream or marshmallows if desired. Enjoy!